I feel that any site on Walking in Snowdonia would not be complete if this walk were not included. It is frequently completed either as a challenge, or for charity. It consists of all 15 peaks in Wales which are over 3000 ft in height. Until the last OS survey there were only 14 peaks marked on the OS map of over 914 m (3000 ft), hence this walk is often known as the 14 peaks or the Welsh 3000s. This section will fistly give a route plan which I used in 1997. The walk was completed on a very hot day which added to the time taken quite significantly. The table below shows the location, distance , height gain, expected time and actual time. Following this is a description of the route, which includes several possible variations. In places the route detail is sketchy, since there are better descriptions of the individual sections elsewhere on this site. There are three starting points. One is to reverse the given route, thus finishing on the Snowdon range. 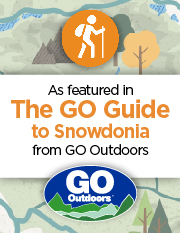 The second is to start on Snowdon and then make your way to Crib Goch, and down by Llyn Glas to the Llanberis pass. From there continue as suggested. The described route begins at Pen y Pass, and follows the Pyg Track round to Bwlch Moch. From here turn off the Pygk to make your way up to Crib Goch on the right. This is a scramble described elsewhere on this site. Make your way along the Arete when you reach the top, and over the pinacles. You should drop down to a col, before heading up to the trig. point at the summit of Crib y Ddysgl. From here it is a short simple walk around to Snowdon the highest point of your walk. We will descend down the Llanberis path past Clogwyn and half-way house. Just past Hebron station you have two choices. You can descend steeper ground to the edge of Llyn Peris, or continue down the Llanberis path to Llanberis and then walk up the road. Either way you should walk along the length of Llyn Peris to the village of Nant Peris. From here you take the route described in the Glyderau section to the peak of Elidir Fawr. Follow the path around to by Foel Goch but there is no need to ascend it. Instead of going left up to the summit continue straight on, and you will re-join the main path just before Y Garn. Follow it up Y Garn and down the other side to Llyn y Cwn, from where you carry on up a steep scree slope to the summit of Glyder Fawr. Carry on to Glyder Fach. Again you have choices. There is a scree slope to the East of Bristly Ridge which is a quick but more strenuous way to descend. Alternatively make your way down to the Miners Track and then across to Bwlch Tryfan. From the Bwlch head North to the summit of Tryfan. Now you could choose to descend the North ridge, which is most difficult, Heather Terrace which is a bit easier, or go back to the Bwlch and down to Llyn Bochlwydd and Idwal Cottage. This is the easiest and you can then buy a drink or snack if you want. This is realistically the last civilisation before the end of the walk, but be warned there is still a long way to go. It is possible to head straight up Pen yr Ole Wen from the cottage, however for environmental reasons it is preferred for you to walk along the length of Ogwen and up to Ffynnon Lloer. Then take the ridge to the summit of Pen yr Ole Wen. Most of the height gain is now dealt with, although there is still significant distance left. Make your way around the cliffs to Carnedd Dafydd and on to Carnedd Llwewllyn. Now you need to visit the outlier, Yr Elen. This is cursed in poor weather, but in good conditions it is a most enjoyable walk. From the outlier you need to return to Carnedd Llewellyn before heading off North to Foel Grach and Garnedd Uchaf (recently added to the 14 peaks to make it the 15 peaks!). Finally head off from Garnedd Uchaf to the North East and find the wall which leads to the summit of your last peak- Foel Fras. Having completed the walk you need to make your way off the hills. I would recommend taking the route down over Drum to Abergwyngregyn. This is again described in the Carneddau section of the site. When you arive at Aber (and this path seems incredibly long and never ending in the dark when you are tired and walking on your own) take a well deserved rest. If needed you can get a taxi all night from Lunns, telephone 01248 353535.